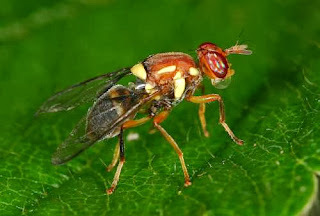 There are over 200 native species of fruit fly in Australia with only a few being a problem for gardeners, however this event can be quite significant. Fruit flies range in size from one to two millimeters. They can be easily recognized by the rather bulbous shape of their lower bodies, which is frequently an orange or light brown colour. They are relatively slow flyers, often hovering around fruit or vegetables. The most effective practice is to prevent female fruit flies from laying their eggs so you can have healthy, ripe home grown veggies and fruit. This can be done by using traps which lure the fruit fly. A simple, nontoxic, inexpensive way to trap them is to place a banana peel inside a clear plastic container (like a take away container) and make three or four holes in the cover with a standard round toothpick. Be sure to pull the toothpick all the way through the plastic and wiggle it around to make a hole large enough for a fruit fly to crawl through. Place the plastic container in or near where there are fruit flies. The odor of the banana peel will effectively lure the fruit flies into the container and they cannot find their way out. If you see fruit flies crawling around on the surface of your plastic container but not going inside, make the holes a little larger. 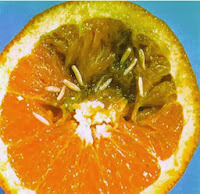 Most of us only notice fruit fly when it is too late and the fruit has already been stung and is full of maggots. Fruit that has been stung should be destroyed - by feeding to the chooks, drowning them or cooking them in a plastic sealed bag in the sun. Several varieties of fruit will happily ripen on the kitchen window sill, like tomato and mango so pick them early and enjoy them before the fruit fly can sting them!